Is Alexa your BFF? Do you have the Amazon Echo or Echo Dot devices in your home? Digital voice assistants like Alexa are very handy when you want to control your smart home gadgets or when you want to ask questions and play your favorite music without using your phone, or your computer. Being able to use your voice to say “Alexa, turn up the heat” or “Alexa, play songs by U2” makes you feel like you’re living in the future. But how can we take Alexa with us on road trips in our vehicles? The Speak Music Muse Alexa voice assistant is like a miniature Amazon Echo for your car. Let’s check it out. The Speak Music Muse Auto is an Alexa voice assistant with a microphone and forward and back buttons that plugs into a power socket in your car. The Muse has a black plastic puck-shaped device with a microphone, a status LED, and two buttons. Attached to it is a cable connected to it that has a 3.5mm input cable and a USB connector. 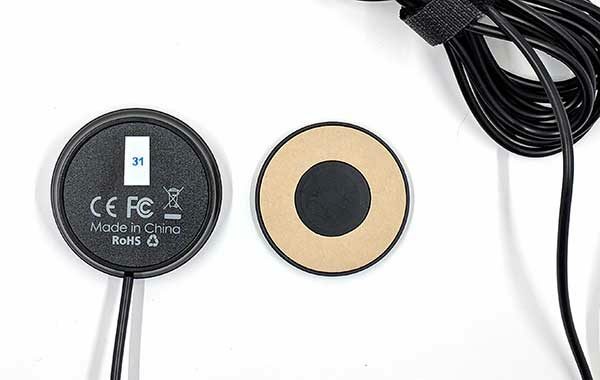 On the back of the device is a magnetic mount that can be used to affix the Muse to a flat surface on your car. 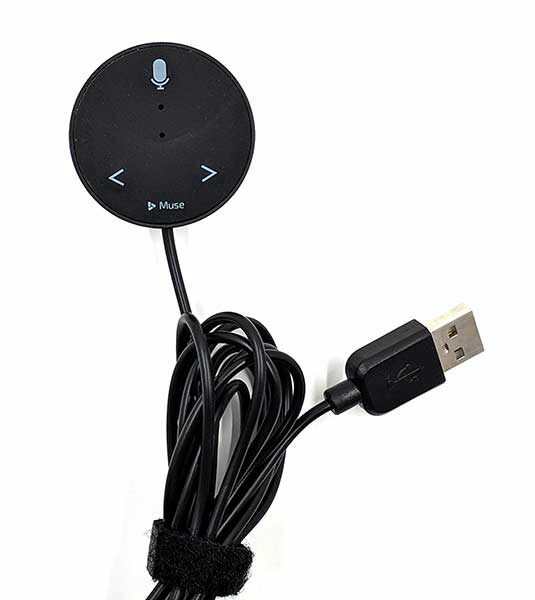 The Muse voice assistant is powered through a USB cable. 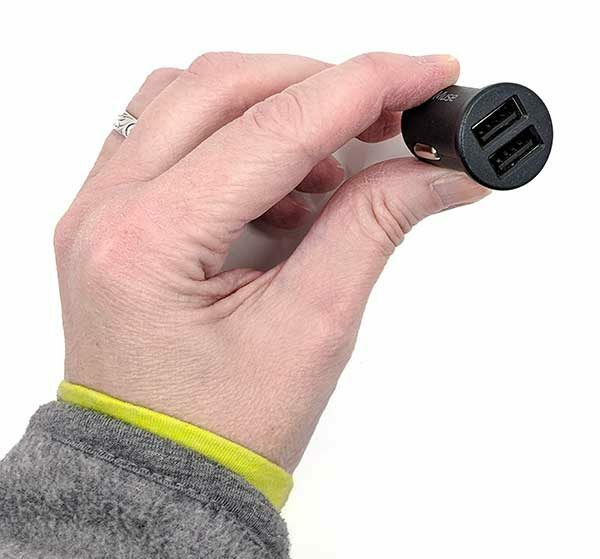 If you don’t have a USB port in your car, you can use the included dual port 12V power adapter. Installing and setting up the Muse is pretty easy. First, you need to find a place in your car to attach it. 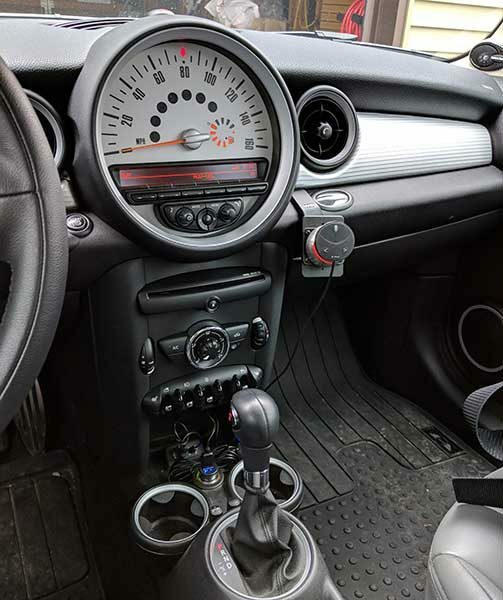 I didn’t have a good place to stick the adhesive mounting disk in my MINI Cooper, so I just stuck it to the iOMount that I already had installed in my car. The next step is to install the Muse app on your phone. This is needed because your phone will be doing all the heavy lifting as far getting the info when you ask Alexa questions or command it to control other devices in your home when you’re on the road. For the most part, you won’t even look at the app once it’s installed and you’ve set up Muse in your car. 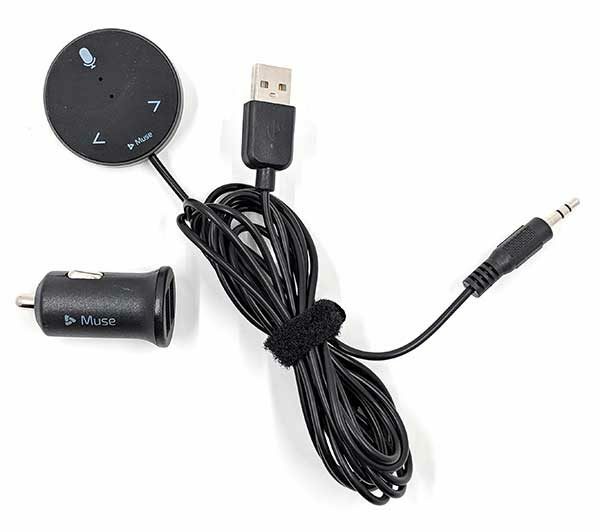 It will ask you to either connect the Muse via Bluetooth to your car, or you can use the 3.5mm cable to connect it to the Aux In jack in your car if you have one. From there, all you need to do is start talking to Alexa which you do exactly like you do with an Amazon Echo or Echo Dot, by saying “Alexa” and then your command or question. You will need to wait for a tone before saying your command or tone. It should also be obvious that you’ll need to have a good signal on your phone in order to have a connection to the internet when you’re driving. During my week or so of testing the Muse, I did all the usual things I would do with Alexa at home, I would ask her to read me the news, tell me what time it was, ask her where the nearest gas station was, play my favorite tunes, turn up the heat in my house, etc. All that worked as I had expected it to work. I did run into a few small issues though. If I had my favorite music cranked up, and wanted to play another song or give Alexa another command, she sometimes would not be able to hear me unless I yelled her name a couple of times. However, the physical buttons on the Muse device are handy for skipping tracks when you don’t feel like shouting. I also was disappointed that there was no way to get turn by turn directions to a destination. You can ask where the nearest store is and Alexa will give you the address, but she won’t tell you how to get there. She also won’t let you call people in your contacts. But, she will pause music or other playback if calls come in and then resume after the call ends. 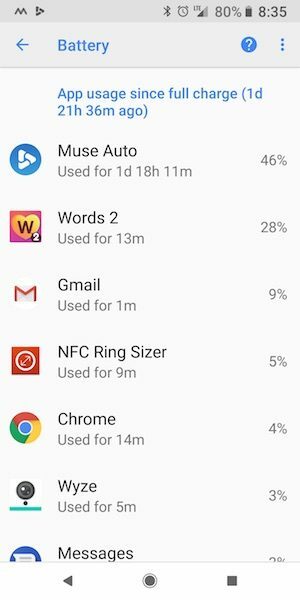 One other issue that I noticed is that the Muse app is always running in the background which can be a drain on your battery. I did all my testing with my Pixel 2 XL and noticed a drop in my battery life after starting to use Muse which you can see above in the Android battery details. I like a totally hands-free way of interacting with music when I’m driving and being able to hear news briefs instead of waiting to hear them on my normal radio stations. 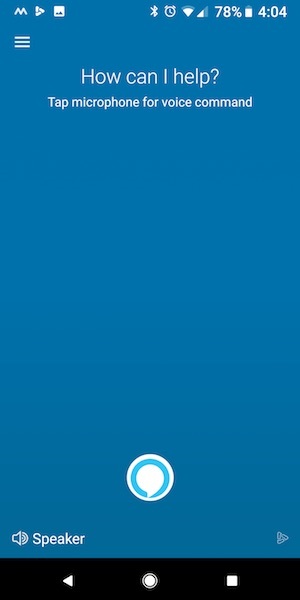 Muse is a fun and easy way to have an invisible assistant do your bidding and I’m looking forward to when it can do even more than it can do now. 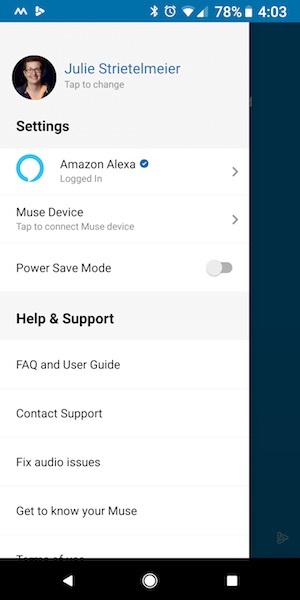 I was contacted by Muse to let me know that they have added the navigation feature to the Muse app. So I installed Muse in my MINI Cooper again this morning to test it out. I can report that yes, the app will now let you get turn by turn voice directions by saying “Alexa, navigate to Cummins”, or “Alexa, navigate to Walmart”. The first time you’ll be prompted to choose the navigation app like Google Maps. From then on it just works. 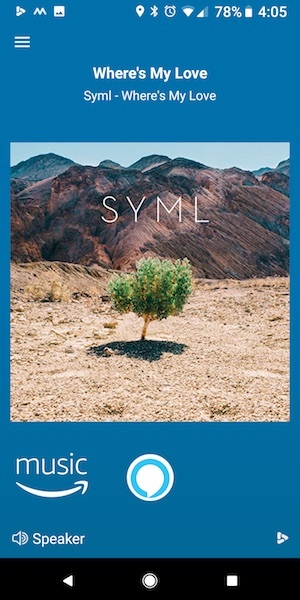 Source: The sample for this review was provided by Muse. Absolutely no comparison to Google Now/Assistant already installed on most Android phones made this review kind of useless to me. A Hater is gonna hate, Hate, HAte……Did it say a Comparison on products = No. It says: Speak Music Muse Alexa voice assistant review. And THANK YOU to the reviewer.